I know that there are probably LOADS of posts and stuff floating around on the web about the similarities of Friends and How I Met Your Mother (HIMYM)… AAAAAND I don’t care. I want to have my time in the so-called lime light, by stating some cool similarities that I noticed all by my lonesome! My opinion… nothing beats Friends. 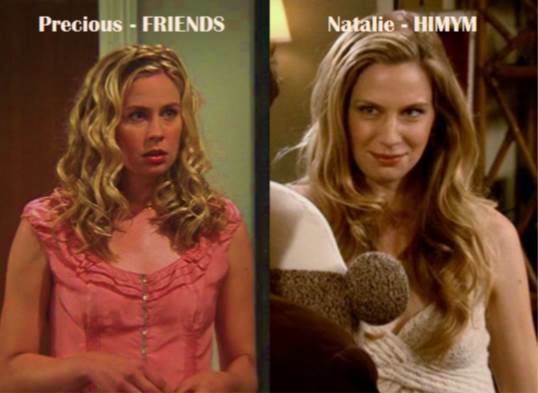 There are a few similarities, like how both shows are in New York, both shows have time flash backs, in both shows at least one of the characters move away for a while, in both shows 2 of the characters are better friends with each other than the rest (Ted & Marshall – HIMYM, Chandler & Ross – Friends), in both shows at least 2 of the main characters marry each other, in both shows the characters constantly live with each other eg. In Friends, Rachel lives with Monica, then Phoebe, then Joey and then Ross. Ross lives with Joey and Chandler and then with Rachel, Chandler lives with Joey and then with Monica, Phoebe lives with Monica and then with Rachel. In HIMYM, Ted lives with Marshall and Lily then lives with Robin, Lily lives with Marshall and Ted, then lives with a raccoon (come on, you know I had to) then lives with Barney, Robin lives with Ted after living with 5, yes! that FIVE, dogs. In Friends its the couch and or bar stools and chairs around said couch in The Central Perk. In HIMYM its mostly one booth in MacLaren’s Pub, but varies to different spots during the show. In Friends Chandler never hides his occupation, the other characters just never remember what he does. In HIMYM Barney just goes “Please!” when asked what work he does, so far I still don’t know what he does. In Friends S10E01 – Precious is Mike’s girlfriend and Phoebe tells her that Mike is back with her… all of this happens on her birthday. In HIMYM S01E04 – Ted tries to make it work with his previous girlfriends, one of which is Natalie, a girl he dumped 3 years earlier… on her birthday. She gives him another chance and he soon realises that he has to break up with her, which he does… on her birthday. AGAIN! In Friends we all know her by her erm… lovely… laugh and that disturbing OH. MY. GWAD. 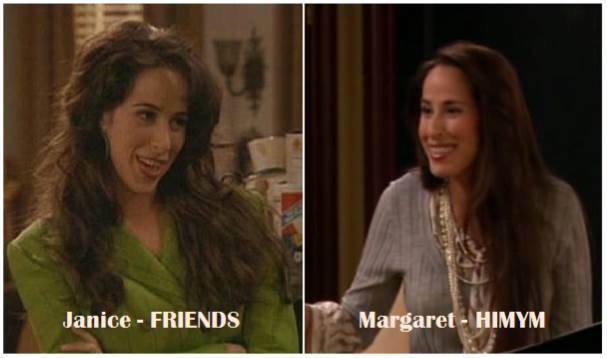 Yes, it’s Janice. Run off to Las Vegas to get married quick – doesn’t happen. Eventually does get married, and Joey conducts it. Move to the suburbs after getting hitched. They have trouble getting pregnant. Date on and off throughout the show. Run off to Atlantic City to get married quick – doesn’t happen. Eventually does get married, and Barney conducts it. They have trouble getting pregnant… in the beginning. Those are the ones I can remember now, I’m sure there are waaaayyy more… so feel free to enlighten me. PS. I have since written another VS post. You can carry on reading about similarities HERE. This entry was posted in English Posts and tagged Anne Dudek, Barney, Chandler, Friends, HIMYM, How I Met Your Mother, Maggie Wheeler, New York, Rachel, Robin, Ross, Ted. Bookmark the permalink. I never even thought about this! Mind blown! Each to their own… Friends is my ultimate! Watched a few episodes this morning again… QUALITY! Oh you really should… its the best! Speaking of which… Isn’t it time we had a marathon? I’ve have since realised some other interesting similarities… but these I think are fine. Marathon shall be held asap. I need my Jane and Friends fix! The actress who plays Monica’s mother plays Lilly’s grandmother! YES!!! I totally forgot about that. Thank you! Dis n plesier… Told yah!! Ross and Ted both have jobs considered boring and annoying by the group. Friends is a thousand times better than How I Met Your Mother. Better characters, better writing, better actors, better cameos, vastly better Finale. HIMYM literally is a parody or Friends. My thoughts exactly!!! I enjoy How I Met Your Mother, it’s just not Friends. Ted and Ross are both professors. However I did point it out in my second comparison 🙂 Friends vs. HIMYM 2.0. There is a link in the comments to that post. Hope you enjoy it.